"It's outstanding - I have never seen anything like it", commented 90-year old Dorothy, who served in the Royal Artillery during World War Two. The annual Christmas Cake Ceremony, which commenced in 1950, is a symbol of enduring friendship between the UK and Australia. 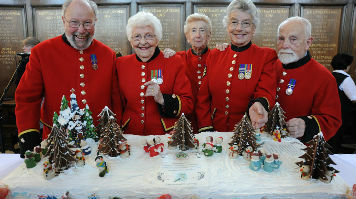 For the ceremony, the Australian Returned & Services League (RSL) - the equivalent of the Royal British Legion - each year donate a colossal Christmas cake to the Chelsea Pensioners, with each State of Australia taking it in turns. For the 2013 ceremony, the National Bakery School was commissioned by the state of Victoria, on behalf of the Returned and Services League (RSL), to create a traditional fruit cake. The creation of the cake required all hands on deck and saw 10 National Bakery School students from various courses working together to mix ingredients, create marzipan choirboys and snowmen, as well as chocolate Christmas trees. The cake also features Australian badges, flags, symbols and birds related to the state of Victoria, which were made using computer technology. Due to the size and weight associated with a 4-foot fruit cake, it took no less than four grown men to carry the cake out of the School and prepare it for transport to Royal Hospital in Chelsea. The prestigious ceremony took place in the Great Hall in the Royal Hospital Chelsea, complete with trumpeters of the Guards Brigade - and all Chelsea Royal Pensioners in full uniform. The Mayor of Chelsea, Councillor Charles Williams was in attendance, along with the Governor of the Royal Hospital. As a fitting homage to the relationship between the UK and Australia, the ceremonial first cut was made by Chelsea Pensioner Jack Rogerson, who had served both for the British and Australian forces - using a traditional sword. The National Bakery School at LSBU has been renowned for its unique ceremonial baked goods ever since it opened in 1894. Notable creations have included Prince Charles' christening cake - and in 2004 bakery students worked with designer Jean Paul Gaultier to recreate some of his iconic designs in bread.